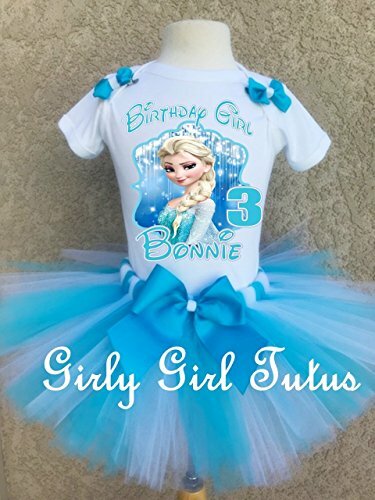 Frozen Elsa and Birthday Tutu outfit. Outfit comes complete with white and blue tutu. Iron on transfer heat pressed design as pictured with detachable bows for top and the tutu. I use a commercial grade transfer paper to print designs before they are heat pressed using a commercial heat press (not a home iron) All designs in sample photo are in digital format so images may appear slightly brighter than actual heat pressed design. Colors can vary as it appears in sample photo. Outfits are custom made to order and ship out aprox 4-5 business days from date of purchase. This doesn't include weekends or holidays. Please review size chart inside picture 2 for bodysuits and shirt sizes. Do not hesitate to contact me with any questions. Tutu waist band 6-12 months 15.5"......... 12 month waist band 16"..........18 month waist band 17"...... 24 month waist band 18"..........2T waist band 18"...........3T waist band 19"..........4T waist band 20"...... 5/6 waist band 20.5". These are elastic waist bands that also have a little stretch. If you require different measurements for the tutu please message me after purchase. Tutus are made to be short and garments worn underneath so length for tutus will range from 6" to 9" depending on size you choose. If you have any questions about this product by Girli Girl Tutus, contact us by completing and submitting the form below. If you are looking for a specif part number, please include it with your message.